Hot days and warm nights won't be here forever, and neither will the produce stands bursting with fresh summer fruit. Now is the time to get baking with summer's bounty of fresh fruit. 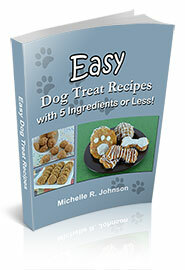 Make plenty now and freeze a few for the winter months so your dog can enjoy summer all year long. Start your baking with an all time favorite, our Blueberry & Banana Oat Muffin. You can easily mix and match the berries in this recipe, too. Instead of a 1/4 cup of blueberries, try raspberries or strawberries. The milk can be substituted for non-dairy milk, and lastly you can substitute the rye flour for an equal amount of whole wheat or a gluten free mix. 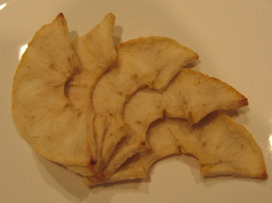 Soft Dried Apple Slices are the perfect treat to make and share with your dog. 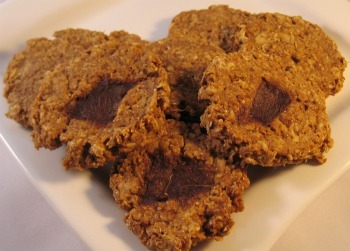 With only 4 ingredients, one of which is water, and the cinnamon is optional, you could already have what you need to make this sweet dog treat. Our third featured recipes uses sweet peaches. Don't think your dog will like peaches? Have you asked him? Every dog we've asked to try these peach cookies has gladly obliged. 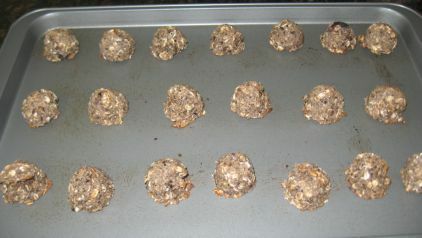 :) We made the cookie chewie and added molasses, vanilla and cinnamon for those harder to please doggie palates. Chewie Peach Dog Cookies. We used frozen peaches for the recipe, but fresh would be so much more delicious. "Thank you so much for your efforts and hard work. I just found a few nice recipes for my new doggie son and have made him about 3 different treats now. He loves them and they are cost effective (much cheaper than buying treats at the store). Thank you so much & God Bless You!"